Repetitive stress injuries or WEAR and TEAR injuries can strike any part of the body that is regularly used while on the job. For desk workers, this often takes the form of carpal tunnel syndrome or tennis elbow. For those in the construction industry or who regularly lift heavy items for work, it can be lower back or knee injuries. Even arthritis can arise over a long period of time at work. One less common but equally difficult type of WEAR and TEAR injury that frequently affects workers who lift heavy objects or engage in upper body work is a rotator cuff injury in the shoulder. This type of injury can be particularly challenging for workers because, not only does it sometimes develop gradually, but it has a high rate of recurrence. A rotator cuff injury is a type of injury in the shoulder. The rotator cuff is a group of muscles and ligaments that help your arm bones to operate properly within the shoulder socket. Sometimes, those muscles or ligaments can be injured through a sudden accident. But more often, WEAR and TEAR arises slowly over time. Over time, rotator cuff injuries can lead to permanent weakness of the muscles or a loss of motion. Rotator cuff WEAR and TEAR can also lead to immobility in the shoulder joint, making it difficult for a worker who uses his arm to do his job. While any type of worker can suffer from a rotator cuff injury, they most commonly occur with workers who frequently lift their arms overhead. For example, painters and carpenters are often disproportionately affected by rotator cuff injuries. Warehouse workers may also suffer from this injury if they are frequently required to lift items above their head. 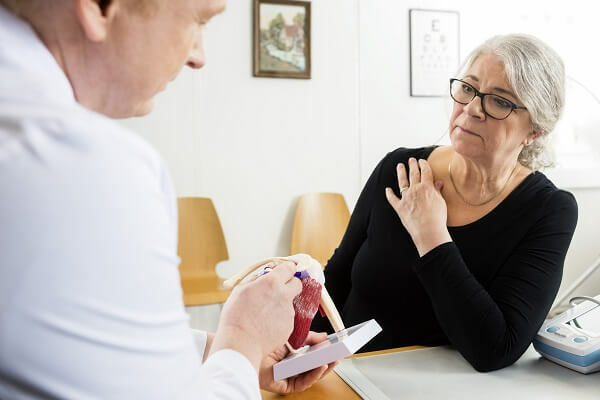 For employees, one of the most challenging aspects of a rotator cuff injury is the fact that it can arise very slowly over time and the injury may not be immediately obvious. Rather than a sharp pull or tear in the muscle, WEAR and TEAR of the rotator cuff slowly leads to injury and immobility – often taking years to fully develop. A worker may experience dull pains in the shoulder. But frequently, this is excused as normal muscle pain that occurs after a tough day’s work. The dull pain may come and go over time, leading the worker to believe that the problem is just muscle soreness or that whatever injury had occurred is resolved. Because an employee bears the burden in a workers’ compensation claim to prove that his or her injury occurred on the job, the slow and insidious nature of a rotator cuff injury may make this difficult to do. A worker may not realize when the injury truly began to develop or what caused it. As a result, the worker may not begin to make note of the injury until much farther along in the progression. This can lead workers’ compensation insurers to deny a claim for workers’ compensation payments based on the belief that the injury is a result of growing older, other hobbies that the individual may have, or an accident that occurred outside of the job. For workers’ suffering significant pain and unable to work, this can be extremely frustrating. In this situation, if your injury occurred as a result of your work, you may be entitled to receive permanent disability payments for your injury. Partial permanent disability is available to workers who lose the function of a specific body part – like a shoulder or an arm – due to an injury. Even if you can eventually return to some sort of employment, you are entitled to this compensation because of the loss you experienced. If you are suffering from a rotator cuff WEAR and TEAR injury that has made it difficult (or impossible) for you to work, you should speak with an attorney about the possibility of a workers’ compensation claim. If your injury is so severe that you face permanent damage to your shoulder, you may even be entitled to permanent partial disability payments. At Petro Cohen Petro Matarazzo, our workers’ compensation attorneys can help assess the best path forward for you in treating your injury and obtaining compensation. Our team of experienced attorneys have over 100 years of combined experience in the practice of workers’ compensation and have handled thousands of cases involving WEAR and TEAR injuries. The benefits payable for WEAR and TEAR claims are identical to accident related workers’ compensation benefits. Temporary Disability Benefits – You are entitled to up to 400 weeks of tax-free temporary disability benefits, based on 70% of your wage for any medical condition that is either caused or worsened by your employment. Permanency Benefits – There are additional workers’ compensation benefits known as “permanency benefits”, which are awarded by a Judge of Compensation based upon medical evidence supporting a measurable loss of physical function. Most work related surgeries, fractures, dislocations, tears, disc bulges, protrusions, and herniations qualify. These benefits can be pursued up to two years from the last date of medical treatment, even if the person has not pursued workers’ compensation benefits or even if the person no longer works for the employer where the original accident occurred. Total Disability Benefits – When your work injury permanently limits the kinds of work you can do or your ability to earn a living, you would receive total disability benefits. Our attorneys will work closely with you and can also advise you on what benefits may be available give your specific situation. For more information or a free consultation, contact us online or at (888) 675-7607.